Catholic Charities welcomes individuals and families of all faiths or no faith tradition. The Fayetteville regional office serves the following counties: Cumberland, Hoke, Lee, Moore, Robeson, and Scotland. This office is a United Way Partner Agency and collaborates with community agencies to serve families in need. We have a new policy on donations which can be found here. The Fayetteville Regional Office provides professionally-trained clinical counseling services to individuals, couples, and families. Services can be paid for with private insurance, based on our standard fees, or through a sliding fee scale based on income and family size. For more information about these services, please visit our main Counseling Page. Eye Movement Desensitization and Reprocessing (EMDR) Services – EMDR is a form of psychotherapy that enables people to heal from the symptoms and emotional distress that are the result of disturbing life experiences. Repeated studies show that by using EMDR therapy, people can experience the benefits of psychotherapy that once took years to make a difference. Comprehensive Anger Management Curriculum – Individuals are able to work with a clinician on an individual basis in order to learn functional ways to handle stress and manage conflict with healthy, non-aggressive cognition and behaviors. Addressing hunger and food insecurity is one of the many issues affecting our immediate communities. The Fayetteville Regional Office provides tangible assistance to alleviate food insecurity for those who seek out assistance. Individuals/families must provide a written referral before coming to the office. For more information about receiving a referral, please contact Yolanda Flores at 910-424-2020 ext. 21. Food items are strictly non-perishables. According to Feeding America, more than 134,000 individuals in the Fayetteville Deanery live in food insecure homes. Financial and in-kind donations are needed to assist these families. Please use this Food Item List as a guide when choosing what to donate. An average of 1,000 families are served through our food pantry each year. Sara.McMcormick@Raldioc.Org or at 910-424-2020 to schedule an appointment. Visit the Immigration page for more information about what services we provide. Named after long-time volunteer Marie Foti, Marie’s Baby Closet features items for babies and small children such as diapers, clothing from 0-5T for boys and girls, formula, baby blankets, baby food, coats, and much more. We are thankful to community who donate to the baby closet and allow us to serve families with little children with loving care. Expectant mothers and other members of our community in need of baby items need a referral before coming to our office. For more information about receiving a referral, please contact Yolanda Flores at 910-424-2020 ext. 21. Services in Support of the Family provide assistance for poor, isolated and vulnerable families in our community. Families receive a comprehensive assessment of needs, which results in either initial problem-solving for many issues, or a supported referral to connect with other services within the community. Assisting families to develop skills and utilize opportunities to improve their lives. Assisting families to establish and/or maintain stable and supportive family environments. Providing opportunities for families within neighborhoods and communities to meet and provide mutual support for each other. Helping individuals with strong leadership abilities develop skills to benefit their community. As part of our Services in Support of the family, we offer parenting classes. These classes are offered in a group setting and are lead and facilitated by a clinical professional. The group setting allows parents to share common issues and often creates a support network among participants. If interested, please call our office at 910-424-2020 for dates and times of upcoming classes. 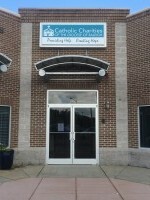 Volunteers play a very important role in the services that Catholic Charities provide. Below are current volunteer opportunities in our Fayetteville Office. Please contact the office manager at 910-424-2020 ext. 21 for more information about volunteering with Catholic Charities. As a Volunteer Income Tax Assistance (VITA) program volunteer, you will interact with people who need help preparing their tax returns at no cost to them. Volunteers can serve as Instructors, Site Coordinators and Tax Preparers. All volunteers will be provided with free tax law training, E-file Software training, and administrative support. Responsibilities include: filing, reception, working in the food pantry (stocking shelves with food, organizing and implementing logistics for food donations and distribution), entering data, and organizing donated clothes. Responsibilities include: conducting screening interviews to identify clients’ needs, assisting in the ESL or GED classes, assisting with resume writing, and working in the childcare area. To find out how you can volunteer, please contact the Fayetteville Office at 910-424-2020.